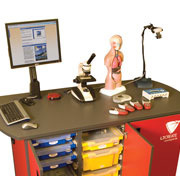 The mobile Science Cart incorporates a series of digital presentation tools linked to an on-board computer. This is loaded with a comprehensive series of science presentations and lessons that can also be supplied as SCORM-conformant packages that can be loaded on to your VLE. Using these resources, teachers are able to provide engaging lessons in Biology, Chemistry and Physics across Key Stages 3, 4 and 5 in any suitable teaching space outside the traditional science lab. Each of the lessons supplied covers a specific topic area and provides essential theory, hands-on practical activities and continuous student assessment. The inclusion of a digital camera and scientific image processing software allows the teacher to conduct experiments that are projected for whole-class viewing. This can even include the examination and evaluation of specimens using the high-quality optical microscope supplied with the system. Trays of hardware for experiments are available on the cart, allowing the teacher to demonstrate activities to the whole group. We also supply a complete range of pre-configured experiment kits presented in storage trays that are compatible with the science cart storage system. Extra trays can be kept in mobile carts or stored in racks in a technician room. You simply load your cart with the specific experiment trays you need for your lessons and it's ready to go. Students can use laptop computers to follow the digital curriculum or they can work from printed worksheets that can be instantly generated by the teacher for the current lesson. Active learning is known to be more effective than passive learning and we provide plenty of opportunity for hands-on experiments with the Science Cart.